The Brussels-Capital Region, the BRIC (the Brussels Regional Informatics Centre) and SMIT (an imec research lab at Vrije Universiteit Brussel) are establishing a platform for experimentation in three Brussels districts, called by ‘Brussels by us’. The platform is tasked with devising smart city innovations for Brussels. The neighbourhoods are Noordwijk, the pedestrian zone in the city centre and the VUB/ULB campus in Ixelles. 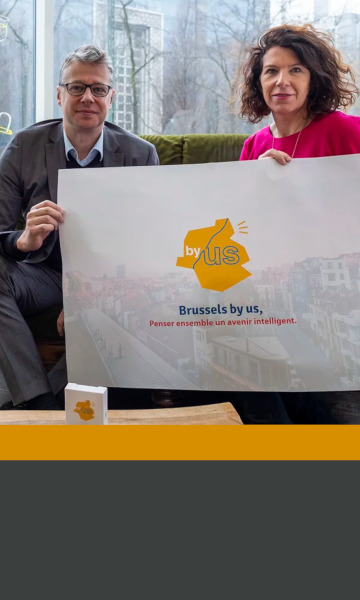 ‘Brussels by us’ aims to activate the local ecosystem in the neighbourhood and help solve real problems to improve the lives of the residents and visitors. They will organise surveys, experiments and workshops, involving both the locals and visitors, using their needs and ideas as a starting point. Zone I – Noordwijk: possible themes include safety, urban agriculture, smart mobility, the revaluation of vacant buildings, etc. The target audiences are commuters and professionals who work in this neighbourhood as well as the neighbourhood residents themselves. Zone II – Central (pedestrian zone): possible themes here include tourism, (type of), trade, public space; the target audiences are traders, tourists, visitors and the neighbourhood residents. Zone III – U-Square (VUB/ULB campus): potential themes include smart education and entrepreneurship, sustainability on campus, food waste, etc. ; the target audiences are students, academic staff, start-ups, fablabs and neighbourhood residents. In every zone, a survey will be launched, as part of a co-creation project, during workshops in smart cafés, after which the project aims to reach a larger target audience with a mobile app and beacon technology. At least ten beacons will be installed in every zone, which allow the platform to ask users context-specific questions on their smartphone. The mobile app, for iOS and Android, features a map with all the available locations where users can be triggered and where they can share ideas and needs, according to the prioritised themes of the co-creation project. The app also enables users to review the survey results and will be available in NL, FR and EN. Information panels will be installed along specific access roads to these neighbourhoods, to inform residents and people passing through. The panels are a marketing instrument and inform people about the concept and presence of the beacons in the neighbourhood. An information hub and meeting point will also be established in every neighbourhood, in the form of smart cafés. These smart cafés will be co-founded with local organisations. Brussels by us receives support from the Brussels Regional Informatics Centre (BRIC). Get involved in the smart future of Brussels! The smart city is oriented to its citizens and businesses… and listens to their ideas.